Who doesn't love pizza? I think it's the best comfort food anywhere in the world and any time of the day. Personally I really like the Neapolitan style pizza specially when it is made the traditional way, and of course wood-burning oven certainly helps to give that touch of smoke and the crispiness of the crust. Another note in the topic is that I almost always order myself a Margherita without any extra toppings. 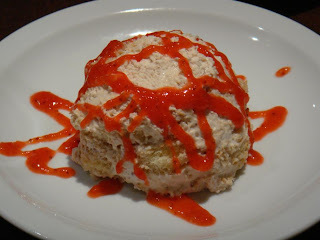 I believe you get to taste the real deal without any topping taking it away from the crust, cheese and the tomato sauce. Few leaves of basil seals the deal, for me at least. My wife loves her Prosciutto on top of her pizza specially if it is freshly sliced. 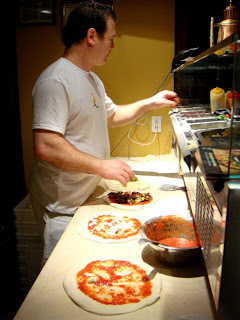 Our favorite Neapolitan pizzeria in Manhattan is a very close call between La Pizza Fresca and Ottimo. I think the La Pizza Fresca is a little ahead in the race just because of their impressive Italian fine wine selection but the points for the ambiance and service go to Ottimo. 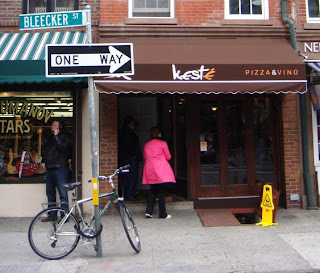 When I heard about Keste, the new kid on the block, I was excited to try a new pizzeria to compare it to our favorites. 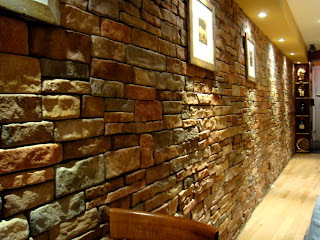 Plus all the hype prior to the opening and also the delay in the opening just added to the excitement. We decided to go over an early afternoon on a Saturday hoping that we didn't have to wait for too long. When we got there about 1:00 p.m. there were three couples ahead of us waiting for a table in the front of the restaurant. Because it is very tight in there, you can't really wait inside. After waiting for about fifteen minutes Rosario ( I believe Roberto's partner called us in and showed us our table. 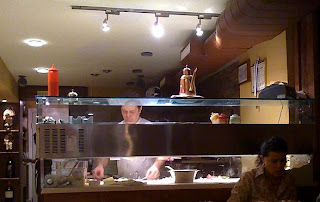 We had a good view of the prep counter and the famous wood-burning oven. We started with a Caprese with red and yellow tomatoes, decent fresh mozzarella toped with fresh basil, olive oil and balsamic vinegar. I would have also like to try the daily special which was rectangular dough topped with some type of a paste and cheese. It did look very good but decided to save it for the next trip. We ordered our Margherita and Prosciutto with arugula pizza and enjoyed them to the last bite. My wife did mention that she thought there were too much fresh arugula and overpowered the taste but I guess that's a personal preference. It took about ten minutes to get the Margherita and another five to ten for the Prosciutto to arrive. To finish our meal with ordered the Strawbery Tiramisu and it did taste as good as it sounded. I noticed few tables ordered the Chocolate Pizza which is a pizza dough topped with Nutella and chocolate powder. That's another thing we will need to try next time. 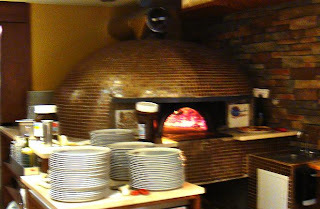 Pros: Authentic Neapolitan style pizza made in wood-burning brick oven.